Launch Weekend is upon us! And no signs of ice anywhere! As a reminder we will be offering our Launch Breakfast Saturday & Sunday morning(s) beginning at 7am. Neil and the kitchen team will also put on their SPECIAL’S Hat with some great Features for the weekend. Our new Spring Menu also launched yesterday, with great reviews! Regardless if you own a boat in the harbour or not, it is a great excuse to stop in at the Club and be part of the activity! I also wanted to remind everyone….Our next “Must Attend” Event - THE FOOD & BEVERAGE FAIR is on Saturday, May 2nd beginning at 6pm. This is a new event to the Club, where we will be having several beer and wine suppliers offering samples of their products to the membership. We will also be featuring many fantastic food items prepared by Chef Neil! This is a great way to reconnect to the Club, say hello to everyone who you have not seen during the winter, meet some new staff (and myself) and see what great plans we have for the upcoming season! It is also a fantastic way to introduce someone new to the Club! The event will start at 6pm and run until 9pm. The cost is $20 per member and $25 for your guests. It is a drop in open house style….however, the ones who arrive early may be treated with some extra surprises from the kitchen. We guarantee fun will be had by all! As the warmer weather approaches and launch draws closer, the office becomes increasingly busy with membership renewals, requests and follow ups. As a reminder to all, the office bills membership’s credit cards on the 27th of each month. Come join the radio control sailors and learn about how these little boats work. Boats will be on display as in previous years. The IOM skippers will hold their annual fleet meeting at 19:00 hours on the second floor. Just in time for Launch Weekend! Yesterday saw the launch of KYC head chef Neil Seguin's new summer menu. Chef Neil's menu will be focusing more on fresh local ingredients, expertly prepared. You can look forward to, Seafood Linguini, house cut fries, which will be featured in our new Steak Frites, as well as new twists on some KYC favourites. We are also featuring a new beer, Smithworks Dunkelweiss, brewed in Peterborough, Ontario. KYC is the only place in Kingston that you can find this delicious German-style Dark Wheat Beer, come down and try a pint! Starting Monday April 27th, KYC will be open 7 days a week! From Monday to Friday the bar will be open from 11:00 to 22:00 and Chef Neil Seguin's kitchen will be serving up our delicious new menu from 11:00 to 21:00 daily. On Saturday and Sunday we will be serving Brunch from 10:00 to 15:00 and the Lunch and Dinner Menu from 15:00 to 21:00. The bar will be open 10:00 to 22:00 on Saturday and Sunday. Weeknight Racing Starts in 2 Weeks! Yes, after a long cold winter we will soon be out there racing again. 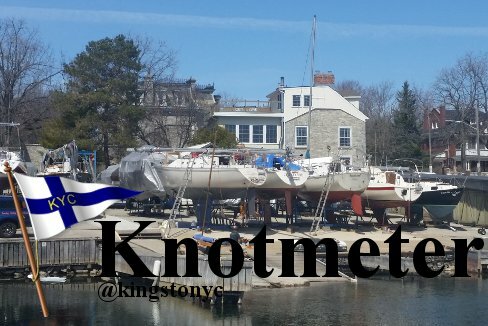 For details on the Racing program (including revised SIs) for the summer, check out the (new for 2015) online "Racers' Handbook" under the "Sailing" area of the KYC web site. to race@kingstonyachtclub.com. Remember: even non-members can be guests up to 4 times per year. We will do our best to provide matches.